It has been a bit quiet this week only a few discoveries and no major purchases to report. Silly things have happened this week like the lawn mower broke and I think some bees have moved into the roof. I rent so I am waiting for my landlord to remedy these problems. As mentioned before last weekend was a girlie one to help celebrate a friend's birthday. We all had pamper treatments. I opted for a Aromatherapy Associates Rose Hydrating Foot Treatment. This involved my feet being scrubbed and polished in various rose, geranium and lavender products from the Aromatherapy Associates range. It was lovely and I highly recommend my feet are as good as new. 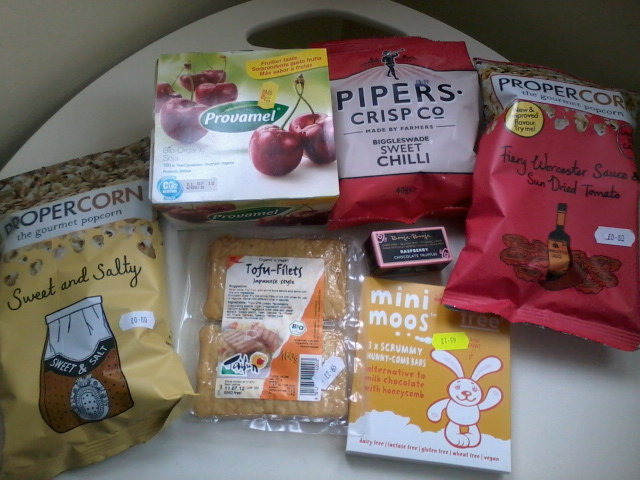 Here are some free from foods that I have been happy to discover this weekend. Propercorn gourmet popcorn sweet & salty & fiery worcester sauce & sundried tomato, Provamel Cherry Soya Yoghurts (Provamel is the name used for the Organic range from Alpro), Taifun Japanese Style Tofu Filets, Pipers Crisps in Biggleswade Sweet Chilli, Moo Free mini moos Hunny-Comb bars, Booja Booja Raspberry Chocolate Truffles. 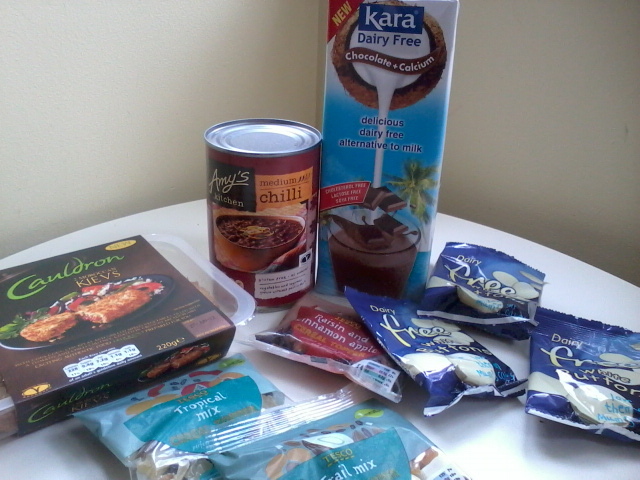 Cauldron Moroccan Kievs, Amy's Kitchen Medium Chilli, Tesco Cereal Topper (raisin & cinnamon apple, trail mix, tropical mix, Kara Chocolate Coconut Milk, Humdinger dairy free white chocolate buttons. I wanted to quickly discuss a topic which keeps popping up on Twitter and Blogs that I am reading. It's all to do with whether Vegan food has a place in the Free From market. Now when I say Free From I am referring to Free From Allergens like gluten, dairy etc.. I believe you can not expect a Vegan food company to cater towards allergies it is purely coincidental that a Vegan diet can slot into a Free From diet. For example, I chose not to eat meat and I'm allergic to milk and eggs so that is why you will find a large amount of Vegan food on my blog. I read a blog post that said that Vegan food should not have featured at The Allergy Show whilst I agree on principal but I was excited to see Vegan foods there because I can eat them. You don't hear of Vegans looking at the Free From aisle and complaining that the dairy and egg free products don't cater for them because they contain honey.